**IMPORTANT** Please note If you order £85 worth of goods ($110 approximately at this time) you can get **FREE SHIPPING** anywhere in the world. (Offer does not apply to multiple bags of 500g Cocoon Strippings) Please quote coupon code FREESHIP in the box at the checkout. This listing is for 1 x 100g hank of Sari Silk Chiffon Ribbon (100% Silk) Hand Dyed by Oliver Twists. 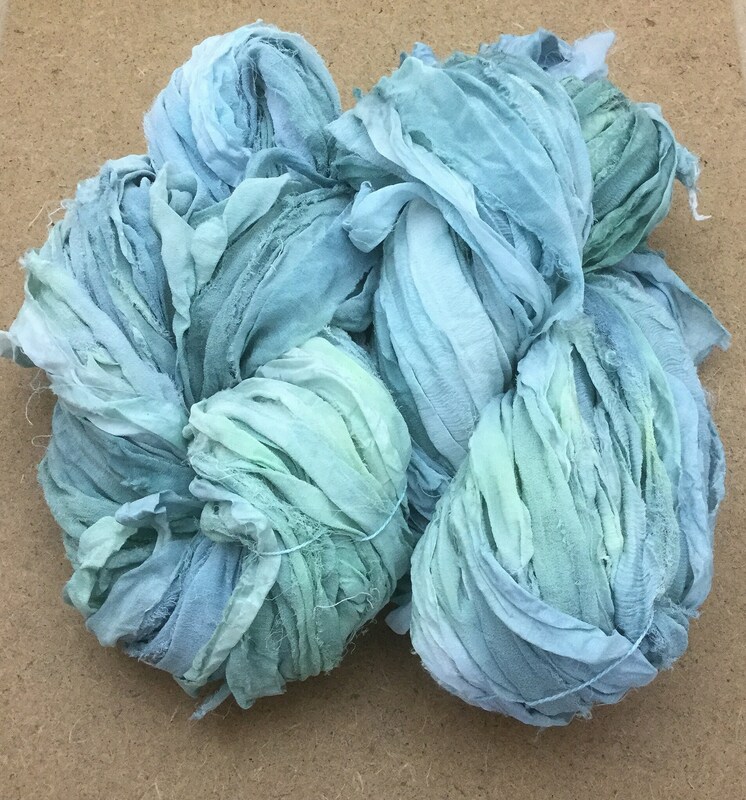 Each skein of Sari silk ribbon is a unique and inspirational ethically produced art yarn. Use for Knitting, Crochet, Weaving, Textile Art, Appliqué, Scrapbooking and many other disciplines. This Sari Silk Ribbon is a biproduct of Silk Sari manufacturing in India and has a beautiful rich quality. They are handmade by womens' co-operatives in rural India from silk that would otherwise have been destroyed and sent to landfill. All our products are stored in a smoke free and pet free environment. We always try to portray our colours as accurately as possible, but please be aware that different monitors display colours in different ways. CAPPED SHIPPING. The first shipping price you see is all you will pay, regardless of the size of your order. We are also offering Free Worldwide shipping on orders over £85 which is approximately $119 (at this time 26/02/2018) Quote Coupon Code FREESHIP at the checkout. We are a VAT registered business. VAT Registration Number GB 747 0015 55. Orders from within the EU will include 20% VAT. If you require a VAT invoice please let us know and we will supply one with your order. You can pay for your order via Paypal, or using Etsy's Direct Checkout with a credit or debit card. You can choose the PayPal Option during checkout. After you submit your order click the "Pay Now" button. scroll down and you will see the option to pay with a Credit or Debit Card WITHOUT having to sign up for a PayPal account. (exceptions to this are large bulky items such as multiple bags of 500g silk fibres or 50 metre rolls of cotton scrim. Please ask for quotes for shipping on these items). We operate a worldwide mail order service and aim to pick pack and dispatch orders within 2 to 5 working days. We post all items by Royal Mail 2nd class 'signed for' within the UK which takes 1 - 4 working days but could take up to 15 working days to arrive. If the item has still not arrived within 15 workings days please contact us. For International postage, we use international standard and international signed for services, please allow up to 25 working days for delivery. Most of our international parcels are however, received within one to two weeks. We post items Monday - Friday and we do not post on weekends. International orders over certain values (this can vary depending on your country) may attract custom fees and/or import charges. This is out of our control and any fees incurred are the buyers responsibility. It is illegal for us to mark the parcel as a gift or sample, unless it is actually a sample (ie. unpaid for). Please check that what you are purchasing will be allowed through customs in your country, if items are returned to us due to being refused by customs, we will refund the cost of the item, but not the shipping fees. If you are in any way unhappy with your purchase please let us know and we will try to rectify the problem. Some items are sold exactly as seen, others have only a representational photograph (eg. The pick and mix selection). We want you to be pleased with your purchases so please make sure you read our descriptions and shop policies so that you know exactly what you are buying. If you wish to return an item, please contact us within 14 days of receipt and return unused with original packaging. Postage is not refunded except where the item is faulty, damaged or not as described. The cost of the postage for returning the item is the buyers responsibility - we recommend that you use an insured/trackable method of return. All our products are dyed in a smoke free and pet free environment. We thoroughly rinse and scour our products of residual dye, but they cannot be guaranteed colourfast. We always try to portray our colours as accurately as possible, but please be aware that different monitors display colours in different ways. In our experience, the colours are best viewed on an Apple iPad in landscape.